In a food processor, pulse the cauliflower florets so it becomes cauliflower rice. To make the hollowed out pineapple boats, first cut the pineapple in half the long way. Cut around the inside of pineapple to create a “boat.” Cut the flesh inside the pineapple into cubes, making long slices down the length of the pineapple, and then cross-cuts about 1 inch wide. Be sure not to cut through the pineapple. Using a large spoon, scoop out the pineapple cubes & flesh, and set it aside. Add the cauliflower rice to the skillet. Add the vegetable broth which is a vegetable bouillon cube and 2 cups of boiling water. Cook for about 6 minutes, or until cauliflower is tender. Stir in corn, peas, carrots, onion, and red & green bell peppers. Cook for 4-5 minutes. Stir in small cubes of pineapple. I used about ½ cup. In a small bowl, beat 2 eggs well. Using your spatula, move all the ingredients to one side of the pan. Pour beaten eggs to the empty side. Stir eggs as they cook to keep them scrambled. Once the eggs are cooked, mix them with the rest of the ingredients. Add GF tamari sauce, and cook for a few more minutes. 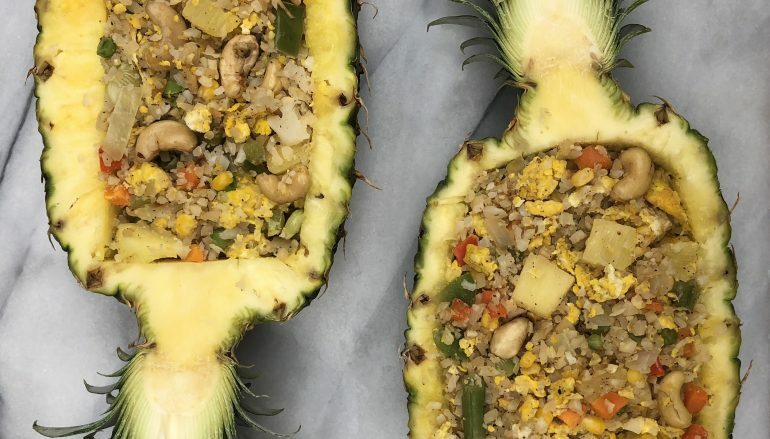 Scoop cauliflower fried rice into the pineapple boats.